New technology under development by Carnegie Mellon Research Professor Mark Bier will allow biochemists and nanotechnology researchers to better weigh heavy molecules. Nanoparticles can't simply be put on a scale to figure out their mass so chemists must find other tools to determine this value. One such technology, mass spectrometry, has improved to the point that particles 1,000,000 times the mass of a miniscule hydrogen atom can be weighed. This mass spectrometer ionizes molecules and then uses an electric field to accelerate them over a certain distance to measure their "mass-to-charge ratio." If all of the molecules have the same charge from the ionization process, the differences in their "time of flight" through the spectrometer can thus be used to calculate their masses. Modern commercially available mass spectrometers are able to accurately distinguish between molecules that differ by only a single atom in mass from a small molecule, but paradoxically to an outside observer, these devices struggle to detect the heaviest of molecules, typically those over 100,000 atomic mass units (for reference, water has a mass of 18 atomic mass units). This is because it's difficult to accelerate these heavy particles to high enough velocities to generate the electron emissions necessary when they impact on a conventional mass spectrometer detector to calculate their mass-to-charge ratio. In addition, ionizing them too aggressively can often be very destructive for larger and more complex molecules, Bier notes. As scientists continue to work to engineer new and innovative nanoparticles to be used in everything from medicine to fabrics to lighting, not being able to measure these molecules precisely is a problem. Working at such small scales means it can be difficult to make different particles identical, and mass spectrometry could be a useful analysis to test the quality of the manufacturing. "When you make new molecules or molecular complexes, you want to know that you made what you thought you made," Bier said. Now, in a study published last month online in the journal ACS Nano and funded by the National Science Foundation, Bier’s group has demonstrated the use of a Superconducting Tunnel Junction cryodetector for ultra-high mass nanoparticle analysis that gets around this massive problem of detection. What sets this detector apart from others used in mass spectrometers is the fact that it's exceptionally cold. With helium-3 and helium-4 refrigeration, Bier is able to cool the detector to 0.35 Kelvin, just a little above Absolute Zero. At this supercooled temperature, electrons within the detector's array of surfaces form what are known as "Cooper Pairs,"
These pairs are very loosely bound together, and so even a slow, heavy nanoparticle striking one of the detector's surfaces is able to vibrate the detector just enough to break up some of these pairs. The unbound electrons can then undergo tunneling and be measured at another detector surface below the first one to register a signal. "This whole ultra-high mass area I'm working in is a new frontier in mass spectrometry," Bier said. For Bier, this is the culmination of a decade of work to be able to measure heavy nanoparticles and understand the resulting signal. However, he has no plans to rest on his laurels, and is already working to further explore another capability of these cryodetectors—their ability to measure the energy a nanoparticle imparts when colliding into them. Bier has noticed how nanoparticles with the same charge and mass but made with different elements and structures will give different energy levels when analyzed with his mass spectrometer. These differences could be a new area of measurement for these molecules. "We think there's information in there," Bier said. While Bier’s lab is currently the only one in the United States doing this work with this kind of mass spectrometer cryodetector, he sees a bright future in these devices to characterize all kinds of nanoparticles. "We're hoping that this technology will become of such interest that people will start to jump on it and want to do it," Bier said. 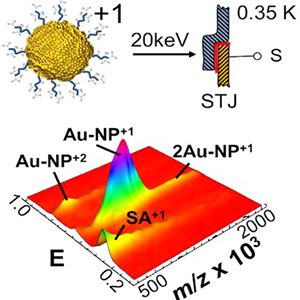 A gold nanoparticle colliding with the top surface of a superconducting tunnel junction cryodetector with 20,000 electron volts of kinetic energy and the resulting ultra-high mass spectrum.